Uprise Standing Desk with Dry-erase Whiteboard Work-surface Stands Tall Among its Electric Standing Desk Competitors... With its contemporary lifting columns, this adjustable standing desk base will amaze you with its functionality, reliability and unique components that will define itself among others in the marketplace. 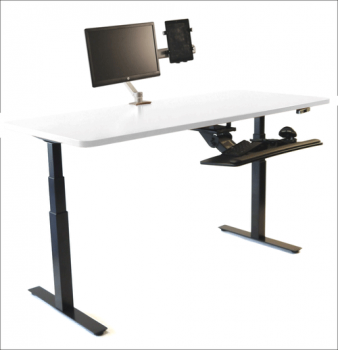 Rather than lock yourself in any particular sized base the desk is both adjustable in height and width! This adjustable height desk base telescopes from 44.5" wide to 74" wide, so the base is ideal for work surfaces ranging from 46" wide to over 84" wide. The Uprise Desk is ideal for anyone whom wishes to sit, stand or even add a treadmill so you can sit, stand and walk at your desk. 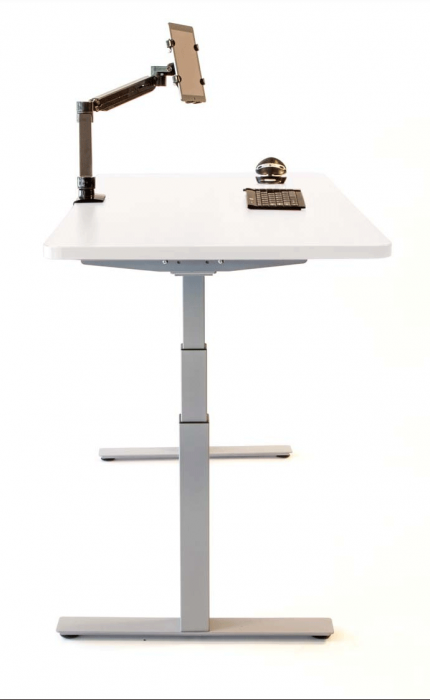 This ergonomic standing desk with its thee stage columns ranges in height from 24" to 50" (this includes a desktop). The Uprise Desk has been weight tested at 400 lbs. Our base is certified at 800 Newtons per lifting column which equates to 180 lbs for a single column base, 360 lbs for a two column base and 540 lbs for the 3 column desk. The Dry-erase whiteboard table top allows you to use both wet erase and dry erase markers is offered in three sizes: 30" x 48," 30" x 55" and 30" x 70". Controller: 4 position LED Pre-set controller.